•Capt. Ross Elder, Williamstown, W.Va.
•Capt. Lacey Schol, Columbus, Texas. •Capt. Matt Underwood, Colleyville, Texas. •Capt. Rick Razack, Las Vegas, Nev.
•Air Force unit: 23rd Wing, “Flying Tigers”, Moody Air Force Base, Valdosta, Ga.
MICHAEL KELLY The Marietta Times Air Force combat pilots Capt. Lacey Schol and Capt. Matt Underwood talk to students at the Washington County Career Center on Friday following a Veterans Day presentation. MICHAEL KELLY The Marietta Times Air Force captains, from left to right, Ross Elder, Lacey Schol, Matt Underwood and Rick Razack wait for presentations to start for the Veterans Day program at the Washington County Career Center on Friday. The four are A-10 Thunderbolt combat pilots visiting from Moody Air Force Base near Valdosta, Ga. On Saturday, they are scheduled to perform a flyover during the West Virginia University – Texas Christian University football game in Morgantown. femalepilot wrote: Bahrain's Air Force (RBAF) First Female Fighter Pilot Born! She URGENTLY needs to work on her landings. Close, VERY close, and the nosewheel would have hit first. 23 SEP 1970: BuNo 157917 NZ6254 is used for the flight of the first female to fly in an RNZAF Skyhawk. RNZAF Official Photo from Don Simms via Phil Thompson. She was born in an Indian town in Paraguay, a sloping baby named Jessica Lorna, and was adopted for adoption in Israel at the age of six months. Today she is a combat navigator in the "One" squadron, and among the operational missions over Gaza she completes a personal operation to find her lost roots. In her first interview, Captain Noa tells how she renewed contact with her biological mother ("I wrote her on Facebook that I'm not angry, not even a little"), describes the emotional turmoil ("when I told my parents, the three of us cried"), I am more worried that the bomb will hit where I did not mean "
Before all, the gaze focuses on her slanted eyes and exotic features. "Indian," her parents called her affectionately, and Captain Noa, the F16i ("Sufa"), never made a fuss. When someone threw a comment on her appearance she drew a ready answer: "I'm adopted from South America." Directness and honesty left the other side stunned. "Since I remember myself, my parents told me that someone else gave birth to me and they adopted me," she says in an interview with Yedioth Ahronoth. "My father has two older children than his first marriage, and my mother, who could not have children, wanted to adopt a child in a legal and orderly manner, both of them Ashkenazim with white skin and I was brown, which is one of the reasons that adoption could not remain a secret," she explains. , And a small smile sits on her face. When she was six months old, her adoptive parents brought her from Asuncion, capital of Paraguay, to the small moshav in the Golan Heights where they live. Her father, Pini, is a farmer, owner of a cowshed and orchards, and her mother, Dalia, now a pensioner, was the head of an academic administration at one of the colleges. Noa grew up as a moshavnik between the cowshed and the groves from which her family made a living, and did not dig too deep into its biological roots. Toward the age of 18, when her parents explained that she could open the adoption file, the decision was made. "Only then did I begin to take an interest in Paraguay, I asked a few questions about my family there, about the circumstances of the adoption, but they did not know the details, and I did not have any questions for my parents, and I talked to them about possible scenarios that could be after I open the file and know who my biological parents are : They may not be alive at all or maybe the mother is a daffodil in some dark alley, I've prepared myself for everything. "And then, on my 18th birthday, I opened the adoption file that came in the mail, and I sat with my parents in the living room and the three of us were very excited, and there was only one old document in the file that said I was born on March 16, 1989 in the town of Itagua, I had Jessica Lorna, who explained that the mother could not raise her daughter for economic reasons and that she had another child of one and eight months and that was it. " Before opening the adoption file, were you afraid of what was going to happen to you? I thought that there would be more details, and after I read I was a bit disappointed, I expected that there would be something about the father, and he was not mentioned at all, and the brother - who later turned out to be a nurse - was mentioned only casually. My parents told me that my biological mother gave me up for adoption so that it would be good for me, and in this document I discovered that there was a brother older than me, whom she raised, and this was the only moment I felt a drop of anger ... My mother saw that it burned me, hugged me and said, But she understood that she would not be able to raise her and therefore gave you adoption in the most orderly way I wonder why I am not and I am. '" Has your identity revealed anything to you? "I was in high school at the time, busy with my studies and my matriculation exams, and I continued my life. It's true that I think about it more, but not at the level of once a day. This layer exists and I am happy with it. " Did you think in those days to get on a plane and start looking for Mom? "When I planned to open the file, I thought I would go, but before the adoption file was opened, I had a meeting with a social worker who explained to me that many adoptive children who open the adoption file and meet their parents return to their lives. I was planning to go to South America in the summer, a few months after I opened the file, but I was already in the army and did not know what was going to be with me, so That the idea of ​​the trip was postponed. " The open adoption file did not provide Noa with answers to questions such as what happened to her biological mother, whether she lived or where and what her marital status was. The only detail she had was her mother's first and last name, and she admits that the lack of knowledge did not spur her to embark on a search for relatives and answers. "I told myself it would come when I was ready, if she was alive then she would be, and if not, then no." Noa continued her routine in a high school in one of the kibbutzim, which she enrolled in at the beginning of eighth grade. Unlike her friends in the moshav and nearby moshavim, who attended a regional school near where they lived, she preferred the high school, which is an hour's drive from her home, mainly because of her love for basketball. After school, she practiced at the basketball court near the school, and when she was at the YMCA traveling back and forth, she rented a room on the kibbutz and arrived home only on weekends, and spent most of her time in the basketball team. When she received the manila before the induction, she was offered mainly training positions. She herself dreamed of a real combat service, but not a pilot course. It was her father who pushed her. "On one of the trips with my father, he asked: Why do not you try to go to a pilot course?" Says Noa. "I said that it was really not right for me, because the pilots were really nerds, but he did not give in. He called the recruitment office and asked if my data were suitable for flying, and when he answered yes he asked me to send a summons. To flight tests, unless they turned on their own initiative and asked for it. "She has amazing abilities," says her father, "and when she is focused on a goal, she does the best things she has, she is 100 and I knew she would be excellent in the course. I told myself that it would be enough to have one year and even her head would straighten up, she would be more square. " Since she was her only daughter, her mother had to sign an agreement that would serve me. "Noa said all the time that she wanted to be a combat soldier and I was not surprised," says her mother. "As a little girl she never played with dolls but with swords, there was a Tom Boy like that, an outstanding athlete who always wanted to be with the boys, not a girl sitting with my mother and together they dried flowers ... My dream was not that she would go to an aviation course, I am very proud of her for completing such a demanding course, and the butterflies that sit in my stomach with worry are being repressed, and that's how I can live with what she does as a navigator. " In January 2007, Noa enlisted in the Israel Air Force and began Flight 161. "In the course I was very busy studying and succeeding, and I did not deal with the fact that we were few girls among many more boys," she says. "If things were said about gender, I did not really notice it, and it seems to me that it was humor, and certainly not one of us was sent to make white coffee." Is there a difference between men and women in terms of flight capabilities? In any case, the level of flight of a person who completes the course - whether male or female - should be very high, otherwise he can not be an air crew member. " The biggest crisis during the course, says Captain Noa, was during the "week of captivity" (an intensive week in which trainees practice falling into captivity) "It was an extraordinary situation that placed me in situations I had not experienced before. In retrospect, I can say that this was one of the most significant events in the course for me. " What kept you in the difficult moments? "We were a very cohesive group in the course, we always helped each other and supported each other, and we had three girls together (Captain S. and Captain D.) and we had an amazing connection that developed into a friendship that continues to this day. There was never a hidden struggle between us. " In December 2010, after four exhausting years, Noa completed the pilot course as a combat pilot. "I believe that a person should be in the place that suits him most, and I am suited to navigating and not flying the plane," she explains. Along with her, two more women graduated from the course. "I was very excited at the graduation ceremony, and my family was even more excited, and they were very happy that they were finally pleased with me," Noa says with a smile. "At the end of the ceremony, we talked to their friends and parents, and at some point the commander of the air force, Maj. Ido Nehushtan, came to me and my mother asked him, 'Who are you?' To this day we laugh at her. "When I got home, my friends from the moshav prepared a big good luck poster at the entrance to the moshav and I was very excited, but it was clear to me that it was just the beginning, and that there was a long way ahead." After the course Noa was placed as a combat pilot in the "One" squadron at the Ramon base. "After my first operational activity, I realized that at last I had completed all the training stages, and from now on every mistake has completely different implications and meanings," she says. A year ago, as part of the Air Force's promotion track, she moved to the position of head of staff in Tel Aviv and now serves as an officer in the IDF's budget department. Once a week she sets up in the Southern Squadron and replaces the Dakron uniform with her overalls. Fear and fear of being captured have no place in her combat life. "When I get on the flight, I do not think about it, but on the other hand, I was not in situations of high risk, but in any case I prefer to remain optimistic. Over Gaza, but since the risk there is negligible, the fear that something will happen to me is almost nonexistent, I am more concerned that nothing will go wrong, that the bomb will not damage the place I did not intend to do (the navigator is responsible for the weapons on the plane and releases the bombs) And that no uninvolved persons enter the territory. It requires very high alertness. " About a year ago, when she was 24 years old, the Paraguayan roots also began to tickle again. Until then, during the course, I did not have time to think about it, but toward the end I thought about ways to connect because I realized that it was not easy to get up and look around South America for the woman who gave birth to me. I did not do much with my thoughts, and only last January did I begin to roam and search the Internet for her name, Theresa (the name), and I wanted to know more about myself. The full is stored in the system - p. On May 10, 2013, I posted messages on Facebook to several women with the same name or a similar name. " Captain Noa put in a tight, short question: "Do you know Teresa, Jessica Lorna's mother?" And launched it into the net. Two days later, on May 12, 2013, a reply came from the unit: "I am Jessica Lorna 's mother, this is my daughter, I am from Paraguay, but I have been living in Argentina for 16 years, please answer me, that' s how you know your story. I did not hear or know anything about you, not even where you came in. You are 24 or 25, your birthday on March 16, today is my 45th birthday. " A few hours later, the woman wrote another message: "I was young and alone and used my ignorance, and I signed an adoption paper, but I was not sane, lied to me, and I did it so that I would not miss you." They told me that I could see you whenever I wanted, But it was a lie and I could not see you But now I'm cured I have children But I do not have you, my love They took advantage of me They took advantage of poverty and ignorance And I was very young You know my love I do not know what to tell you, . Even before she understood what Spanish words were saying on her computer screen, Captain Noa did a quick calculation of the hours. "I realized that she had the middle of the night with her, but that did not prevent her from sitting at the computer and writing to me, and it was clear to me that she was very excited about the way I performed in her life." She answers you and you faint? "Yes, I was in the office and I tried to work, she answered in Spanish and I did not understand anything ... I tried to think about who to send the message to translate, and then I remembered the girlfriend of a friend who spoke Spanish and I sent and a few hours later when I received the translation, I told my commander that something had happened, that I was not concentrating and had to go home, I did not elaborate on anything, but he understood me. "When I got home I did not really know what to write to her, and everything took time because of the translation, but I did not answer her for a couple of days, and yet she sent me another explanation and in more detail. That she could see that I was looking for her, to decide not to answer me on Facebook and to continue her life without me.The next day, May 13, I told her about myself "
Captain Noa summarized her history and sent it to her Paraguayan biological mother. "In Israel, wonderful parents adopted me," she wrote. "I have brothers and a family that I love and a very good life, I guess you did not know where I was and that 's all right, how old did you grow me, who took advantage of you, what did you mean by being insane and now healed? I would get it all with full understanding, it was written that I have a brother who is older than me by a year and eight months, and I am happy if you can write more clearly so that it will be easy to translate, good luck for your birthday. You have nothing to apologize for, because I'm healthy and have a good life. " That day Theresa wrote to her at length about herself, her difficult life and the circumstances in which her daughter was taken for adoption. "My dear daughter, I am happy that you answered me," she wrote. "Today your sisters made me a cake and sang me a happy birthday and you know that one of my wishes was for you to answer me so I can tell you the whole truth about my life and the little time I could hold you in. I want to tell you that you are always present and that I never forgot you. I prayed all the nights in my life that you would be fine and that someday you would come, so I thank God. I come from a very poor family and my parents, to my great sorrow, were ignorant and uneducated and never advised or instructed about life. At the age of 14, I was exploited, and this survivor became pregnant. At the age of 15 he was born and in May he was 30. His name is Jorge Antonio. My parents and family did not forgive me. At the age of 17 I left the house looking for work and I knew the love of my life, but unfortunately it was not mutual. From this relationship I had a daughter, Tania Elizabeth. She's bigger than you in a year and eight months. I continued to live in my family home, but I was rejected. Economically I was in a very bad situation, I had no help from anyone, not even from the family. I was very young, completely alone with two children. " At this stage Teresa described the circumstances in which she conceived and brought Noa, and how, she claimed, her daughter had disappeared from her life. "I did not even know who your father was, and after that night I did not see him ... When my family learned that I was pregnant I was expelled from the house ... I knew a woman who gave me a job and allowed me to live in the workplace, where I stayed during my pregnancy, You know about your existence, but they do not say anything out loud so as not to hurt, because 24 years ago they cut off a piece of my heart ... Now, thank God, I have been married for 16 years to an Argentinian and I have only five children. "He said. The next morning, Theresa sent another message to Noa: "I loved you and will continue to love for the rest of my life, even if you are not with me." Most of the details of the story told her by her biological mother, Noa prefers to keep to herself. "That was the most moving part of our correspondence," she says. "Until then I was sure that she gave me consent and in an orderly manner, so that my best would be, and suddenly reading that she wanted me and took me from her, I was very moved. Or I like it, but in the end it does not matter if it's the real story, it's what she wants to tell me, and I'm here and we found each other and there's nothing to dig for now ... At no point during our correspondence did I ask: 'Why did you give me? ' I just wanted to get to know her and my biological family and not take account of the past. " Do you know if she's been looking for you over the years? "According to the correspondence, she searched for me immediately after she lost me, and then she gave up. It bothers you that you do not know who your biological father is? "I know now that he does not exist in my biological mother's life, and in fact he does not even know about my existence, which I'm interested in being the one who raised me for four months - he's my father in DNA, but that's less than a year for me." Despite Captain Noa's openness to adoption, one can not help but notice how difficult it is. She says a few sentences and re-starts, examines the words that come out of her mouth and corrects the wording. "I'm hot, I'm sweating," she announces, asking to open the air conditioner and increase the cooling power, sipping a lot of water, going out to smoke to relax. It seems that talking, for her, is much more complex than navigating a fighter jet on an operational mission. Noa did not share her efforts with her adoptive parents in the search for her biological mother. What she went through was revealed to them only after a few days of close correspondence. "One day, before dinner, we sat on the balcony and wanted to tell them, and I said that I had something important to tell, but I could not speak a word, and they waited patiently for me to read. I told them that it was more important to me than opening the adoption file and seeing the names, so I wanted to cook with the search and locate only with myself. : 'What fun for you, you have two families who love you.' "Dad offered to buy everyone T-cards Total Argentina to Israel and invited the family to stay for a seat. I asked him to calm down and I told him I wanted things to happen at my own pace. " Her parents, Pini and Dalia, remember precisely that evening on the porch. "We were so happy for Noa that she found her sources," says Fini. "The relationship she created with her biological family does not really threaten me because I am very sure of my place in her life, because we are the ones who raised her, and Noa knows that the moment we received her was a defining moment in our lives. We were brought to the hotel in Asuncion by a six-month-old girl who was at her biological mother's house until she was four months old and another two months in a foster family, wrapped in a shiny white cloth, clean and clean The first morning I got up in bed she looked at us and rocked the stick, We got a strong bond, we wanted to have an Indian girl It's brown because I have two Polish children, and her variety only adds to life. " Today, when I walk with her in Tel Aviv and she is in uniform with the wings of the pilot, people do not remain indifferent, point to her and say, "No one is laughing at her because of her appearance. When I ask her how she gets along with this, she explains to me in the most natural way: Since I was little I was different and pointed at, so I do not make a fuss We really liked her Indian look, and besides that she is Indian in her personality and behavior, Opinionated and rebellious. "I always say that with every subject we can deal with it if it is not a secret, so the word adopt is living with us from the moment Noah came to us. When we heard that she had found her biological mother, I said to her: 'You can call her mother, because what you have between me and you will not be with anyone in the world, I am not afraid of what I have to say. Lied because I know it will never be in my place, but my mother has only one and that's me, the biological mother and her children Treats as Noa's relatives and that's fine. " Dalia stresses that Noa's adoption process is carried out with strict observance of the rules of law in Paraguay and Israel. "In the 1880s, children from Brazil were adopted, but then there was the case of the girl Caroline Bruna, who was adopted by a couple of Israelis and her Brazilian biological mother fought for her until the court ruled that she should be returned to her biological family in Brazil. The children's service there demanded that we adopt an adoption process in the service of the child in Israel, and that is what we did and we opened an adoption file according to all the procedures, in Paraguay we took a lawyer who accompanied the whole process. "He said. In her detailed correspondence with her biological mother, Noa told her what she was doing in her life. The pilot course that she passed and being a combat navigator was not even mentioned in any way, especially for information security reasons. She made do with the words "I have a respectable job." In the meantime she also has no plans to tell her about herself in a phone call or Skype because of the language barrier. "At first, the correspondence between us was almost daily, then the pace slowed down and I write once every month or two, and both I and I understood that we are in a whole place in our lives and that we still meet." When I want to share something that happens to me, I tell my parents that my biological mother calls them ' But I was happy, for example, that my biological mother and sister Tanya wrote to me about two months ago that I had a nephew, Maurizio, who had a need to share with me their celebrations and very excited me to be part of them. Capt. Noa is a seamstress in the Air Force until 2020, but plans to take a free vacation in South America to learn the language in a year and a half, after completing her current assignment, and only a few months later to arrive in Argentina for her first encounter with her family. "As far as I'm concerned, it's not just a post-army trip, but a trip with a very significant layer, and I want to get there ready, a good Spanish speaker and know the way." Do you ever wonder what would happen to you if you were raised in Paraguay and not adopted by an Israeli family? "I do not deal with it, but I believe that wherever I was living, I would be the same person who is happy with himself." Is it possible that sometime you will choose to connect to the roots and live in South America with your biological family, or will you return to the Golan Heights seat? "This is my home, I have no other home, I can go to visit the family in Argentina, but it is clear to me that I will return to Israel, but in the next few years I will be in Tel Aviv, where I found my corner. I need nature, grass and trees. " היא נולדה בעיירה אינדיאנית בפרגוואי, תינוקת מלוכסנת עיניים בשם ג'סיקה לורנה, ונמסרה לאימוץ בישראל בגיל חצי שנה. היום היא נווטת קרב בטייסת "האחת", ובין הגיחות המבצעיות מעל עזה משלימה מבצע אישי למציאת שורשיה האבודים. בראיון ראשון מספרת סרן נועה איך חידשה את הקשר עם אמה הביולוגית ("כתבתי לה בפייסבוק שאני לא כועסת, אפילו לא קצת"), מתארת את הטלטלה הרגשית ("כשסיפרתי להורים שלי, שלושתנו בכינו"), ומשתפת בחוויית הטיסה: "הפחד כמעט לא קיים. אני יותר מודאגת שהפצצה תפגע במקום שלא התכוונתי"
לפני הכל מתמקד המבט בעיניה המלוכסנות ובתווי פניה האקזוטיים. "אינדיאנית", קראו לה הוריה בשם חיבה, וסרן נועה, נווטת F16i("סופה"), אף פעם לא עשתה מזה עניין. כשמישהו זרק הערה על המראה שלה היא שלפה תשובה מוכנה: "אני מאומצת מדרום אמריקה". הישירות והכנות הותירו את הצד השני המום. "מאז שאני זוכרת את עצמי ההורים שלי סיפרו לי שמישהי אחרת ילדה אותי והם אימצו אותי", היא מספרת בראיון ל"ידיעות אחרונות". "דיברנו על זה הכי פתוח שאפשר. לאבי יש שני ילדים גדולים מנישואיו הראשונים ואמי, שלא יכלה ללדת, רצתה לאמץ ילד באופן חוקי ומסודר. שניהם אשכנזים עם עור לבן ואני שחומה, וזו אחת הסיבות לכך שהאימוץ לא יכול היה להישאר סוד", היא מסבירה, וחיוך קטן מתיישב על פניה. כשהייתה בת חצי שנה הביאו אותה הוריה המאמצים מאסונסיון בירת פרגוואי למושב הקטן ברמת הגולן שבו הם גרים. אביה, פיני, הוא חקלאי, בעל רפת ומטעים, ואמה, דליה, כיום פנסיונרית, הייתה ראש מינהל אקדמי באחת המכללות. נועה גדלה כמושבניקית בין הרפת למטעים מהם התפרנסה משפחתה, ולא חפרה עמוק מדי בשורשיה הביולוגיים. לקראת גיל 18, כשהוריה הסבירו לה שהיא תוכל לפתוח את תיק האימוץ, התגבשה אצלה ההחלטה. "רק אז התחלתי יותר להתענין בפרגוואי, שאלתי קצת שאלות על המשפחה שלי שם, על נסיבות המסירה לאימוץ, אבל הם לא ידעו את פרטי הפרטים ולא לכל שאלה הייתה להוריי תשובה. דיברתי איתם על תסריטים אפשריים שיכולים להיות אחרי שאפתח את התיק ואדע מיהם הוריי הביולוגים: יכול להיות שהם בכלל לא בחיים או אולי האמא היא נרקמנית באיזו סמטה חשוכה, הכנתי את עצמי להכל. "ואז, ביום הולדתי ה־18, פתחתי את תיק האימוץ שהגיע בדואר. ישבתי עם ההורים בסלון ושלושתנו מאוד התרגשנו. בתוך התיק היה רק מסמך ישן אחד, ובו נכתב שנולדתי ב־16 במארס 1989 בעיירה איטאגואה, עיירה אינדיאנית קרובה לבירת פרגוואי ושהשם שניתן לי היה ג'סיקה לורנה. במסמך הוסבר שהאם לא יכולה לגדל את בתה מסיבות כלכליות ושיש לה ילד נוסף בן שנה ושמונה חודשים וזהו". לפני פתיחת תיק האימוץ פחדת ממה שעומד להתגלות לך? "אני לא זוכרת שפחדתי. הייתי בעיקר סקרנית. חשבתי שיהיו יותר פרטים, ואחרי שקראתי הייתי קצת מאוכזבת. ציפיתי שיהיה משהו על האבא, והוא בכלל לא הוזכר. האח — שמאוחר יותר התברר שזו בכלל אחות — הוזכר רק כבדרך אגב. עד שפתחתי את התיק ההורים שלי אמרו לי שהאמא הביולוגית מסרה אותי לאימוץ כדי שלי יהיה טוב, ובמסמך הזה גיליתי שיש אח גדול ממני שאותו היא כן גידלה. זה היה הרגע היחיד שהרגשתי טיפת כעס. אמא שלי ראתה שזה צרב לי, חיבקה אותי ואמרה: 'לא משנה שיש לך אח, אבל אותך היא הבינה שלא תוכל לגדל ולכן מסרה אותך לאימוץ באופן הכי מסודר. הדברים האלו הרגיעו אותי בשנייה ויותר לא שאלתי את עצמי למה אותי לא ואותו כן'". גילוי הזהות שלך שינה בך משהו? "הייתי אז בכיתה י"ב, עסוקה בלימודים ובבגרויות, והמשכתי בחיים שלי. נכון שאני חושבת על זה יותר, אבל לא ברמה של פעם ביום. הנדבך הזה קיים ואני שמחה איתו". חשבת באותם ימים לעלות על מטוס ולהתחיל לחפש את אמא? "כשתיכננתי לפתוח את התיק חשבתי שאסע, אבל לפני פתיחת תיק האימוץ הייתה לי פגישה עם עובדת סוציאלית, שהסבירה לי שהרבה ילדים מאומצים שפותחים את תיק האימוץ ופוגשים את הוריהם חוזרים אחר כך לחיים שלהם, אבל בחייהם של ההורים הביולוגים נפתח משהו שמטלטל אותם וצריך לחשוב גם עליהם. זו הייתה נקודה מאוד משמעותית, ואמרתי לעצמי שאני חייבת להתחשב במה שזה יעשה לצד השני. לכן החלטתי לא למהר. תיכננתי לנסוע לדרום אמריקה בקיץ, כמה חודשים לאחר שפתחתי את התיק. אבל כבר הייתי לפני הגיוס ולא ידעתי מה הולך להיות איתי, כך שרעיון הנסיעה נדחה". תיק האימוץ הפתוח לא סיפק לנועה תשובות לשאלות כמו מה עלה בגורלה של אמה הביולוגית, האם היא חיה ואיפה ומהו מצבה המשפחתי. הפרט היחיד שהיה בידיה הוא שמה הפרטי ושם משפחתה של האם, והיא מודה שאי הידיעה לא דירבנה אותה לצאת למסע חיפוש קרובים ותשובות. "אמרתי לעצמי שזה יגיע כשאני אהיה מוכנה. אם היא תהיה בחיים אז היא תהיה, ואם לא — אז לא". נועה המשיכה בשגרת חייה בבית ספר תיכון באחד הקיבוצים, שאליו נרשמה בתחילת כיתה ח'. בניגוד לחבריה במושב ובמושבים הסמוכים, שלמדו בבית ספר אזורי הקרוב למקום מגוריהם, היא העדיפה את התיכון הנמצא במרחק שעת נסיעה מביתה, בעיקר בגלל אהבתה לכדורסל. לאחר שעות הלימודים הייתה מתאמנת במגרש הכדורסל הסמוך לבית הספר, וכשהייתה בי"א מאסה בנסיעות הלוך וחזור, שכרה חדר בקיבוץ והגיעה הביתה רק בסופי שבוע. את רוב מרצה השקיעה בקבוצת הכדורסל. שקיבלה את המנילה לפני הגיוס הוצעו לה בעיקר תפקידי הדרכה. היא עצמה חלמה על שירות קרבי של ממש, אבל לא על קורס טיס. מי שדחף היה דווקא אביה. "באחת הנסיעות עם אבא הוא שאל: למה שלא תנסי ללכת לקורס טיס?" מספרת נועה. "אמרתי שממש לא מתאים לי, כי הטייסים נורא חנונים. אבל הוא לא ויתר. הוא התקשר ללשכת גיוס ושאל אם הנתונים שלי מתאימים לטיס, ומשנענה בחיוב ביקש שישלחו לי זימון. שאלו אותו האם אני רוצה והוא השיב בחיוב בשמי. בתקופה ההיא בנות לא זומנו למבדקי טיס אלא אם הן פנו ביוזמתן וביקשו. כשזומנתי למבחנים ממש נכנסתי לעניין". "יש לה יכולות מדהימות" מספר אביה, "וכשהיא ממוקדת מטרה היא עושה את הדברים הכי טוב שיש. היא תלמידה של 100 וידעתי שתהיה מעולה גם בקורס. יחד עם זה, לא הייתי בטוח שתסיים, כי אני יודע שיש חבר'ה טובים כמוה שמודחים מהקורס. אמרתי לעצמי שמספיק שתהיה שנה אחת אפילו והראש שלה ייתיישר, היא תהיה יותר מרובעת". מאחר שהיא בתה היחידה, נדרשה אמה לחתום על הסכמה שתשרת בקרבי. "נועה אמרה כל הזמן שהיא רוצה להיות קרבית ולא הופתעתי", מספרת אמה. "כילדה קטנה היא אף פעם לא שיחקה בבובות אלא עם חרבות, הייתה טום בוי כזאת, ספורטאית מצטיינת שתמיד רצה עם הבנים, לא ילדה שיושבת עם אמא ויחד הן מייבשות פרחים. החלום שלי לא היה שהיא תלך לקורס טיס, אבל כשנועה אמרה שהיא רוצה, לא עמדתי בדרכה. אני מאוד גאה בה שסיימה קורס תובעני כל כך, ואת הפרפרים שיושבים לי קבוע בבטן מרוב דאגה אני מדחיקה. כנראה ככה אני יכולה לחיות עם מה שהיא עושה כנווטת". בינואר 2007 התגייסה נועה לחיל האוויר והחלה את קורס הטיס מספר 161. "בקורס הייתי נורא עסוקה בללמוד ולהצליח ולא התעסקתי בזה שהיינו מעט בנות בין הרבה יותר בנים", היא מספרת. "אם נאמרו דברים בעניין המגדרי לא ממש שמתי לב לזה, ונראה לי שזה היה בהומור. מה שבטוח, אף אחת מאיתנו לא נשלחה לעשות קפה לבנים". יש הבדל בין גברים לנשים מבחינת יכולות הטיסה? "בין אדם לאדם יש הבדלים ברמת טיסה. זה תלוי באישיות וביכולת באוויר. בכל מקרה, רמת הטיסה של מי שמסיים את הקורס — בין אם הוא גבר ובין אם היא אישה — צריכה להיות גבוהה ביותר, אחרת הוא לא יוכל להיות איש צוות אוויר". המשבר הגדול ביותר במהלך הקורס, מספרת סרן נועה, היה ב"שבוע השבי" (שבוע מרוכז שבו מתרגלים החניכים נפילה בשבי – ע"מ). "זו הייתה סיטואציה יוצאת דופן שהעמידה אותי במצבים שלא חוויתי בעבר. בדיעבד אני יודעת לומר שזה היה אחד האירועים המשמעותיים בקורס עבורי". מה החזיק אותך ברגעים הקשים? "היינו חבורה מאוד מגובשת בקורס. תמיד עזרנו אחד לשני ותמכנו זה בזה. בנוסף היינו שלוש בנות יחד (סרן ס' וסרן ד') והיה בינינו חיבור מדהים שהתפתח לחברות שנמשכת עד היום. בכל הרגעים הקשים היינו משתפות אחת את השנייה, ושמות הכל בפרופורציות. אף פעם לא היה בינינו מאבק סמוי". בדצמבר 2010, בתום ארבע שנים מפרכות, סיימה נועה את קורס הטיס כנווטת קרב. "אני מאמינה שאדם צריך להיות במקום שהכי מתאים לו, ואני מתאימה להיות נווטת ולא להטיס את המטוס", היא מסבירה. יחד איתה סיימו את הקורס עוד שתי נשים. "התרגשתי מאוד בטקס הסיום, והמשפחה שלי התרגשה אפילו יותר. הם מאוד שמחו שהם סופסוף חווים נחת ממני", אומרת נועה בחיוך. "בסיום הטקס דיברנו, החברים וההורים שלהם, ובאיזשהו שלב הגיע אלינו מפקד חיל האויר דאז, אלוף עידו נחושתן. אמא שלי במלוא ההתרגשות והמרץ שאלה אותו: 'הורים של מי אתה?' עד היום אנחנו צוחקים עליה. "את סיום הקורס חגגתי כמו שתמיד חוגגים סיום קורס. עשינו מסיבה גדולה עם כל החברים וכשהגעתי הביתה החברים מהמושב הכינו כרזת מזל טוב גדולה בכניסה למושב וזה מאוד ריגש אותי. אבל היה לי ברור שזו רק ההתחלה, ושיש עוד דרך ארוכה לפניי". לאחר הקורס הוצבה נועה כנווטת קרב בטייסת "האחת" בבסיס רמון. "אחרי הפעילות המבצעית הראשונה שלי הבנתי שסופסוף סיימתי את כל שלבי ההכשרה, ומעכשיו לכל טעות יש השלכות ומשמעויות אחרות לגמרי", היא אומרת. לפני שנה, כחלק ממסלול הקידום הנהוג בחיל האוויר, עברה לתפקיד מטה בתל־אביב, וכיום היא משרתת כקצינה במחלקת התקציבים של החיל. פעם בשבוע היא מתיצבת בטייסת הדרומית ומחליפה את מדי הדקרון בסרבל טיסה. לפחדים ולחשש מפני נפילה בשבי אין מקום בחייה הקרביים. "כשאני עולה לטיסה אני לא חושבת על זה. מצד שני, לא הייתי בסיטואציות של רמת סיכון גבוהה. בכל מקרה, מעדיפה להישאר אופטימית. בפעילות המבצעית שלי — בט"ש (ביטחון שוטף — ע"מ) או 'עמוד ענן' — טסתי מעל עזה, אבל כיוון שהסיכון שם די אפסי, הפחד שמא יקרה לי משהו כמעט לא קיים. אני יותר דואגת תוך כדי הטיסה ששום דבר לא ישתבש, שהפצצה לא תפגע במקום שלא התכוונתי (הנווטת היא זו שאחראית על אמצעי הלחימה במטוס ומשחררת את הפצצות – ע"מ) ושלא ייכנסו בלתי מעורבים לשטח. זה מחייב דריכות מאוד גבוהה". לפני כשנה, כשכבר הייתה בת 24, החלו גם השורשים הפרגוואיים לדגדג מחדש. "האמת שזה חזר לעניין אותי עוד בשלבים האחרונים של הקורס. עד אז, במהלך הקורס, לא היה לי זמן לחשוב על זה, אבל לקראת הסוף חשבתי על דרכים ליצור קשר, כי הבנתי שזה לא פשוט לקום ולחפש ברחבי דרום אמריקה את האישה שילדה אותי. אני לא יודעת למה דווקא בנקודת הזמן ההיא זה התחיל להעסיק אותי שוב, נראה לי שזה פחות קשור לקורס ויותר קשור אליי, רצון לדעת יותר על עצמי. לא עשיתי הרבה עם המחשבות, ורק בינואר שעבר התחלתי לשוטט ולחפש באינטרנט את השם שלה, תרזה (השם המלא שמור במערכת — ע"מ). ב־10 במאי 2013 שלחתי בפייסבוק הודעות לכמה נשים עם אותו שם או עם שם דומה לו". סרן נועה ניסחה שאלה מהודקת וקצרה: "האם את מכירה את תרזה, אמא של ג'סיקה לורנה?" ושיגרה אותה אל מרחבי הרשת. כעבור יומיים, ב־12 במאי 2013, הגיעה תשובה מהיחידה שענתה: "אני אמא של ג'סיקה לורנה. זאת את בתי. אני מפרגוואי, אבל 16 שנים אני גרה בארגנטינה. בבקשה תעני לי. ככה תדעי את הסיפור שלך. מאז שהיית תינוקת לא שמעתי ולא ידעתי עלייך כלום. אפילו לא לאן הגעת. את בת 24 או 25? יום ההולדת שלך ב־16 במארס, היום זה יום ההולדת ה־45 שלי". כעבור כמה שעות כתבה האישה מסר נוסף ובו השלימה פרטים: "הייתי צעירה ולבד וניצלו את הבורות שלי וכן חתמתי על נייר אימוץ, אבל לא הייתי שפויה. שיקרו לי, ועשיתי זאת כדי שלא יחסר לך כלום. אמרו לי שאני יכולה לראות אותך מתי שארצה, אבל זה היה שקר ולא יכולתי לראות אותך. אבל עכשיו נרפאתי. יש לי ילדים, אבל אין לי אותך, אהובתי. הם ניצלו אותי. הם ניצלו את העוני והבורות והייתי מאוד צעירה. שתדעי, אהובתי, שאני לא יודעת מה לומר לך, בתי". עוד לפני שהבינה מה טומנות בחובן המילים הספרדיות שריצדו על מסך המחשב שלה, עשתה סרן נועה חישוב מהיר של השעות. "הבנתי שאצלה אמצע הלילה, אבל זה לא מנע ממנה להתישב ליד המחשב ולכתוב לי והיה לי ברור שהיא מאוד מתרגשת מזה שהופעתי בחייה". היא עונה לך ואת מתעלפת? "כן, די. הייתי במשרד וניסיתי לעבוד. היא ענתה בספרדית ולא הבנתי כלום. זה היה כל כך הזוי. ניסיתי לחשוב למי לשלוח את ההודעה כדי שיתרגמו לי, ואז נזכרתי בחברה של חבר שמדברת ספרדית ושלחתי וכעבור כמה שעות כשקיבלתי את התרגום, לא יכולתי יותר להישאר במשרד. אמרתי למפקד שלי שמשהו קרה, אני לא מרוכזת וחייבת ללכת הביתה. לא פירטתי כלום, אבל הוא הבין אותי. "כשהגעתי הביתה לא כל כך ידעתי מה לכתוב לה, והכל לקח זמן בגלל התרגום. לא עניתי לה איזה יומיים ולמרות זאת היא שלחה לי עוד הסבר וביתר פירוט. בשבועות הראשונים הייתי בסערת רגשות. הבנתי שהיא חושבת עליי ורוצה להיות איתי בקשר. חשבתי על האפשרות שהיא יכולה הייתה לראות שאני מחפשת אותה, להחליט לא לענות לי בפייסבוק ולהמשיך בחייה בלעדי. למחרת ב־13 למאי, סיפרתי לה על עצמי"
סרן נועה תימצתה את קורותיה ושלחה לאמה הביולוגית הפרגוואית. "בישראל אימצו אותי הורים נהדרים", כתבה. "יש לי אחים ומשפחה שאני אוהבת וחיים טובים מאוד. אני מתארת לעצמי שלא ידעת איפה אני וזה בסדר. הכל בסדר? עד איזה גיל גידלת אותי? מי ניצל אותך? למה התכוונת שהיית לא שפויה ועכשיו נרפאת? אשמח אם תספרי לי את כל הסיפור מההתחלה ועד הסוף. אקבל את הכל בהבנה מלאה. היה רשום שיש לי אח שגדול ממני בשנה ושמונה חודשים. האם זה נכון? איך קוראים לו? אשמח אם תוכלי לכתוב יותר ברור כדי שיהיה קל לתרגם. מזל טוב ליום הולדתך. דעי שאני לא כועסת אפילו לא קצת. אין לך על מה להתנצל כי אני בריאה ויש לי חיים טובים". באותו יום כתבה לה תרזה באריכות על עצמה, על חייה הקשים ועל הנסיבות שבהן נלקחה בתה לאימוץ. "בתי היקרה, אני מאושרת שענית לי", כתבה. "היום האחיות שלך עשו לי עוגה ושרו לי יומולדת שמח ואת יודעת שאחת המשאלות שלי הייתה שתעני לי וכך אוכל לספר לך את כל האמת על חיי ועל המעט זמן שיכולתי להחזיק אותך. רוצה לומר לך שתמיד את נוכחת ושלעולם לא שכחתי אותך. תמיד חושבת עלייך ואיפה את. כל הלילות בחיי התפללתי שתהיי בסדר ושיום יבוא ותופיעי. לכן אני מודה לאלוהים. אני באה ממשפחה מאוד ענייה והורי, לצערי הרב, היו בורים ללא השכלה ואף פעם לא יעצו ולא הדריכו אודות החיים. בגיל 14 נוצלתי, ומניצול זה נכנסתי להיריון. בגיל 15 הוא נולד ובמאי מלאו לו 30. קוראים לו חורחה אנטוניו. הוריי ומשפחתי לא סלחו לי. בגיל 17 יצאתי מהבית לחפש עבודה והכרתי את אהבת חיי, אבל לצערי זה לא היה הדדי. ממערכת היחסים הזו נולדה לי בת, טניה אליזבת. היא גדולה ממך בשנה ושמונה חודשים. המשכתי לגור בבית משפחתי אבל הייתי דחוייה. מבחינה כלכלית הייתי במצב רע מאוד, לא הייתה לי עזרה מאף אחד, אפילו לא מהמשפחה. הייתי מאוד צעירה, לגמרי לבד עם שני ילדים". בשלב זה תיארה תרזה את הנסיבות שבהן הרתה והביאה לעולם את נועה, וכיצד, לטענתה, נעלמה בתה מחייה. " אני אפילו לא יודעת מי האבא שלך. אחרי הלילה ההוא לא ראיתי אותו. כשנודע למשפחתי שאני בהיריון גירשו אותי מהבית. היכרתי אשה שנתנה לי עבודה והרשתה לי לגור במקום העבודה, שם שהיתי במשך ההיריון, והלכתי לבד לבית החולים ללדת אותך. כל המשפחה שלי יודעת על קיומך, אבל הם לא אומרים כלום בקול רם כדי לא להכאיב, כי לפני 24 שנה תלשו חתיכה מהלב שלי. עכשיו, תודה לאל, אני נשואה מזה 16 שנים לארגנטינאי ויש לי בסך הכל חמישה ילדים. הלוואי שנוכל להמשיך בקשר. הרבה נשיקות וחיבוקים". למחרת בבוקר שלחה תרזה מסר נוסף לנועה: "אהבתי אותך ואמשיך לאהוב עד שארית חיי, גם אם לא תהיי איתי". את מרבית פרטי הסיפור שסיפרה לה אמה הביולוגית מעדיפה נועה לשמור לעצמה. "זה היה הקטע הכי מטלטל בהתכתבויות שלנו", היא אומרת. "עד אז הייתי בטוחה שהיא נתנה אותי בהסכמה ובאופן מסודר, כדי שלי יהיה הכי טוב, ופתאום לקרוא שהיא רצתה אותי ולקחו אותי ממנה, זה נורא ריגש אותי. מצד שני, התייחסתי לדברים בערבון מוגבל. חשבתי שיש אפשרות שאולי היא מנסה לרצות אותי באיזשהו אופן, או למצוא חן בעיניי. אבל בסופו של דבר לא משנה אם זה הסיפור האמיתי. זה מה שהיא רוצה להגיד לי. אני פה והיא שם ומצאנו אחת את השנייה ואין מה לחפור עכשיו. בשום שלב במהלך ההתכתבויות שלנו לא שאלתי: 'למה נתת אותי?' רציתי רק להכיר אותה ואת המשפחה הביולוגית שלי ולא להתחשבן על העבר". את יודעת אם היא ניסתה לחפש אותך במהלך השנים? "לפי ההתכתבויות היא חיפשה אותי מיד אחרי שאיבדה אותי, ואחר כך הרימה ידיים. עד כמה שהבנתי, היא לא המשיכה לחפש". מטריד אותך שאת לא יודעת מי האבא הביולוגי שלך? "אני יודעת עכשיו שהוא לא קיים בחייה של אמי הביולוגית ולמעשה הוא בכלל לא יודע על קיומי. מה שמעניין אותי שזו היא שגידלה אותי ארבעה חודשים. הוא אמנם אבא שלי בדי־אן־איי, אבל זה פחות משנה לי". למרות הפתיחות שמשדרת סרן נועה בכל הקשור לפרק האימוץ, אי־אפשר שלא להבחין עד כמה קשה לה. היא אומרת כמה משפטים ומאתחלת מחדש, בוחנת את הדברים שיצאו מפיה ומתקנת נוסחים. "חם לי, אני מזיעה", היא מכריזה, מבקשת לפתוח את המזגן ולהגביר את עוצמת הקירור, גומעת כמויות של מים, יוצאת לעשן כדי להירגע. נדמה שהדיבור, מבחינתה, מורכב הרבה יותר מאשר לנווט מטוס קרב בגיחה מבצעית. נועה לא שיתפה את הוריה המאמצים במסע לאיתור אמה הביולוגית. את מה שעבר עליה חשפה בפניהם רק לאחר מספר ימי התכתבויות צפופים. "באחד הימים, לפני ארוחת הערב, ישבנו במרפסת ורציתי לספר להם. אמרתי שיש לי משהו חשוב לספר, אבל לא הצלחתי להוציא מילה מהפה. הם חיכו בסבלנות עד שיתאים לי. הדפסתי את ההתכתבויות והראיתי להם, הם נורא התרגשו ושלושתינו בכינו. הסברתי שלא סיפרתי להם בזמן אמת כיוון שרציתי לשמור עליהם. פחדתי שהדברים יכבידו עליהם ויטלטלו יותר מדי את חייהם. אמרתי להם שזה היה בעיניי יותר משמעותי מאשר לפתוח את תיק האימוץ ולראות בו את השמות, ולכן רציתי להתבשל עם החיפוש והאיתור רק עם עצמי. אני זוכרת שאמא שלי אמרה: 'איזה כיף לך, יש לך שתי משפחות שאוהבות אותך'. אבא הציע לקנות לכולם כרטיסי טיסה מארגנטינה לארץ והזמין את כל המשפחה להתארח אצלנו במושב. ביקשתי שיירגע והסברתי לו שאני רוצה שהדברים יקרו בקצב שלי". הוריה, פיני ודליה, זוכרים במדויק את הערב ההוא על המרפסת. "כל כך שמחנו בשביל נועה שמצאה את המקורות שלה", אומר פיני. "זה חלק שהיה חסר לה בפאזל החיים שלה ואני לא רוצה שיחסר לה דבר. הקשר שיצרה עם משפחתה הביולוגית ממש לא מאיים עליי כיוון שאני מאוד בטוח במקום שלי בחייה, הרי אנחנו אלו שגידלנו אותה. נועה יודעת שהרגע שבו קיבלנו אותה היה רגע מכונן בחיינו. הביאו לנו לבית המלון באסונסיון ילדה בת חצי שנה שהייתה אצל אמה הביולוגית עד גיל ארבעה חודשים ועוד חודשיים במשפחה אומנת, היא הייתה עטופה בבד לבן בוהק, מטופחת ונקייה. בבוקר הראשון שקמתי אליה היא שכבה במיטה, הסתכלה עלינו וניענעה את הטוסיק מצד לצד, משדרת שהיא מקבלת אותנו,אז נוצר החיבור החזק ביננו. רציתי שתהיה לנו ילדה אינדיאנית שחומה, כי יש לי שני ילדים פולנים. השונות שלה רק מוסיפה פלפל לחיים". דליה מוסיפה: "נועה הייתה שונה והיו כאלו שתקעו בה מבטים, אבל היא כריזמטית ומנהיגה מלידה ואני לא חושבת שמישהו צחק עליה בגלל המראה שלה. היום, כשאני הולכת איתה בתל אביב והיא במדים עם כנפי הטיס, אנשים לא נשארים אדישים, מצביעים עליה ואומרים: הנה טייסת. כשאני שואלת אותה איך היא מסתדרת עם זה, היא מסבירה לי באופן הכי טבעי שיש: מאז שאני קטנה הייתי שונה והצביעו עליי, אז אני לא עושה עניין. אנחנו מאוד אהבנו את המראה האינדיאני שלה, וחוץ מזה היא אינדיאנית גם באישיותה ובהתנהגותה, דעתנית ומרדנית. "אני תמיד אומרת שעם כל נושא אפשר להתמודד אם הוא לא סוד, ולכן המילה אימוץ גרה איתנו בבית מרגע שנועה באה אלינו. בהתחלה סיפרנו לה שהבאנו אותה מרחוק וטסנו איתה באווירון לארץ, היא שמעה את המילה אימוץ כשהייתה ממש קטנה, הרבה לפני שהבינה את משמעות המילה. הקראנו לה ספרים על ילדים מאומצים והיה לנו ברור שנהיה איתה כשתפתח את תיק האימוץ. כששמענו שאיתרה את אמה הביולוגית אמרתי לה: 'את יכולה לקרוא לה אמא, כי מה שיש ביני ובינך לא יהיה לך עם אף אדם בעולם. אני לא מפחדת ממה שיקרה כי אני יודעת שזה אף פעם לא יהיה במקומי. הרי אמא יש רק אחת וזאת אני. אל האמא הביולוגית וילדיה אני מתייחסת כאל קרובי משפחתה של נועה וזה בסדר גמור". דליה מדגישה כי תהליך האימוץ של נועה נעשה תוך הקפדה מלאה על כללי החוק בפרגוואי ובישראל. "בשנות ה־80 אימצו ילדים מברזיל, אבל אז הייתה פרשת הילדה קרולין ברונה, שאומצה על ידי זוג ישראלים ואמה הביולוגית הברזילאית נלחמה עליה, עד שבית המשפט פסק שיש להחזירה למשפחתה הביולוגית בברזיל. מאז הופסק האימוץ בברזיל והחלו לאמץ ילדים בפרגוואי. דיברנו והתייעצנו עם ישראלים שאימצו שם ילדים, למדנו את הנושא לעומק, פנינו לעורך דין בפרגוואי. השירות למען הילד שם דרש שנעבור תהליך אימוץ בשירות למען הילד בישראל וכך עשינו ופתחנו תיק אימוץ על פי כל הנהלים. בפרגוואי לקחנו עורכת דין שליוותה את כל התהליך. הכל היה חוקי לחלוטין". בהתכתבויותיה המפורטות עם אמה הביולוגית לא סיפרה לה נועה מה היא עושה בחייה. קורס הטיס שעברה והיותה נווטת קרב לא הוזכרו אף לא ברמז, בעיקר משיקולי אבטחת מידע. היא הסתפקה במילים "יש לי עבודה מכובדת". בינתיים גם אין לה תוכניות לספר לה על עצמה בשיחת טלפון או בסקייפ בשל מחסום השפה. "בהתחלה ההתכתבויות ביננו היו כמעט מדי יום, אחר כך הקצב הואט ואני כותבת פעם בחודש־חודשיים. גם אני וגם היא הבנו שאנחנו נמצאים במקום שלם בחיים שלנו ושעוד נפגש. כשאני רוצה לשתף במשהו שקורה לי אני מספרת להורים שלי — שאמי הביולוגית קוראת להם 'ההורים מהלב' — ולא לה. אבל שמחתי, למשל, שאמי הביולוגית ואחותי טניה כתבו לי לפני כחודשיים שנולד לי אחיין, מאוריציו. היה להן צורך לשתף אותי בשמחות שלהם ומאוד ריגש אותי להיות חלק מהם", היא מספרת. סרן נועה חתומה קבע בחיל האוויר עד 2020, אבל מתכננת בעוד כשנה וחצי, עם סיום תפקידה הנוכחי, לקחת חופשה ללא תשלום, לטייל בדרום אמריקה, ללמוד את השפה ורק לאחר כמה חודשים להגיע לארגנטינה, למפגש ראשון עם משפחתה. "מבחינתי זה לא רק טיול של אחרי צבא, אלא טיול עם נדבך מאוד משמעותי, ואני רוצה להגיע לשם מוכנה, דוברת ספרדית טובה ומכירה היטב את ההווי". את תוהה לפעמים מה היה קורה איתך אילו היית גדלה בפרגוואי ולא מאומצת על ידי משפחה ישראלית? "אני לא מתעסקת בזה, אבל מאמינה שבכל מקום שבו הייתי חיה, הייתי אותו בן אדם שטוב לו עם עצמו". יכול להיות שמתישהו תבחרי להתחבר לשורשים ולגור בדרום אמריקה עם המשפחה הביולוגית שלך, או שתחזרי למושב ברמת הגולן? "כאן זה הבית שלי. אין לי בית אחר. אני יכולה לנסוע לבקר את המשפחה בארגנטינה, אבל ברור לי שאחזור לישראל. בשנים הקרובות אהיה בתל־אביב שבה מצאתי את הפינה שלי. אבל אני מאמינה שמתישהו אגור במושב, לאו דווקא ברמת הגולן, כי אני צריכה טבע, דשא ועצים". So after that novel (in 2 languages) above we only get a picture of her with helmet on????? Congratulations to SiS and for being the first! Glad the USAF finally sees that females would be great in the single ship TAC demo roles. Women should be defined by actions not clichés. Every role in the RAF is open to everyone. From spare time to the front line. 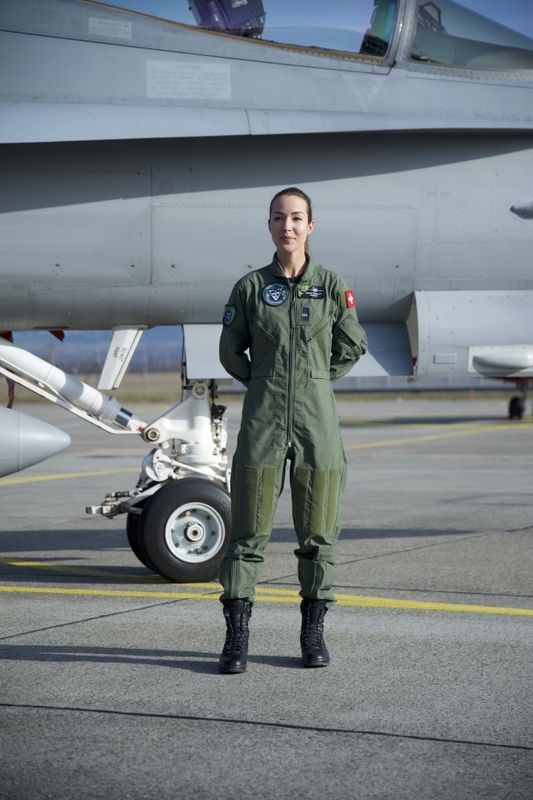 First Lieutenant Fanny Chollet is the first Swiss female pilot of the F/A-18C. 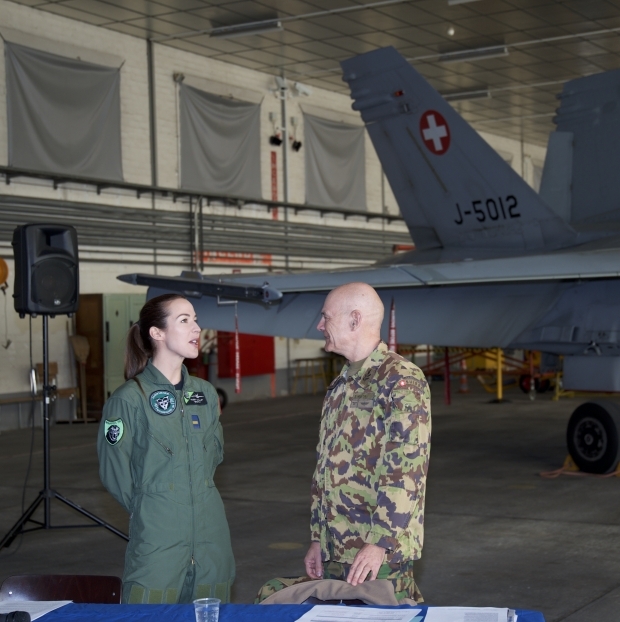 She is also the first Swiss female combat jet pilot (women did fly combat helicopters but not in front line units until recently). Age 28, she flies with Squadron 18 "Panthers" based in Payerne. As a fighter plane zooms through the sky, a woman’s voice says: “Every superhero has an origin story.” That’s the inspiring, high-flying start of the US Air Force’s latest recruitment campaign, one that aims high to get more women into its ranks. 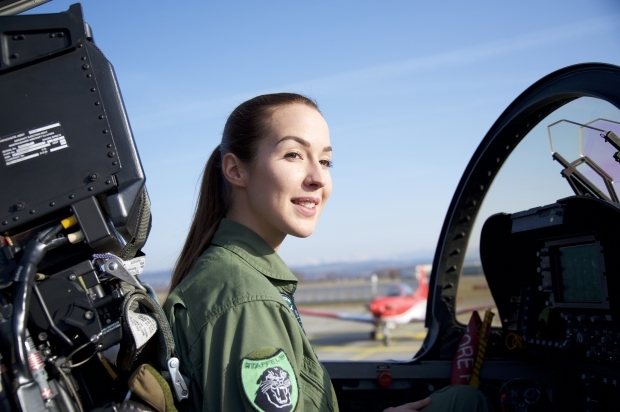 Leveraging International Women’s Day (8 March) and the upcoming Captain Marvel superhero film featuring a female pilot as the titular heroine that releases on the same day, the US Air Force is airing the new film and campaign in partnership with GSD&M, the military branch’s 18-year agency of record. ‘Origin Story’ showcases the inspiring and powerful female pilots that make up the US Air Force. It proudly emphasizes the “women power” that exists within the Air Force by saying it can turn anyone into a hero – just like the empowering theme of the upcoming Marvel movie. The voiceover in the spot states: “We all got our start somewhere, for us it was the US Air Force.” It wraps up with a caption asking “What will your origin story be?” and ends with the familiar tagline “Aim High.” Captain Marvel, in turn, showcases the origins of a heroine who was the first female fighter pilot in the Air Force, progressing from a United States Air Force cadet to outstanding fighter pilot to superhero. The real-life first female fighter pilot in the Air Force was brigadier general Jeannie Leavitt, who currently serves as commander of Air Force recruiting service. She helped to spearhead the 30-second spot after seeing the opportunity to inspire more female recruits. The US Air Force, Marine Corps and Navy are all currently experiencing a 25% shortage of pilots, according to a release. Leavitt brought together a group of 80-plus female pilots, from generals down through almost every rank – second lieutenants and first assignment instructor pilots, fresh out of the pilot training pipeline. All the pilots were filmed in a single day and their stories told on a dedicated webpage. ‘Origin Story’ will appear across national, youth-focused TV channels, including during NBA games for the first two weeks of March. In addition to the TV spot, the campaign will run in theaters and on digital and social media platforms that will feature multiple digital elements. Chinyere Kalu is the first Nigerian female commercial pilot and the first woman to fly an aircraft in Nigeria. She made history when she flew a plane and became a Captain at a time when it was yet unheard of in these parts. After her primary and secondary education at Anglican Girls Grammar School Yaba, she trained as a private and commercial pilot at the Nigerian College of Aviation Technology (NCAT) Zaria in 1978. She rose through the ranks at the Nigerian College of Aviation Technology from 1980 as an Assistant Flying Instructor in-training to Chief Flying Instructor in 2001. From 2006 to 2009, she headed the Flying School. Kalu became Rector of the Nigerian College of Aviation Technology with effect from October 2011, following the approval by President Goodluck Ebele Jonathan and announced by the Federal Ministry of Aviation, becoming the very first to be appointed from among the College Staff. That appeared in the USAF ad.